Of more than 200 clinical cases of porcine reproductive and respiratory syndrome (PRRS), concurrent pulmonary infections caused by a wide range of pathogens were identified in 60 per cent of the cases. 221 PRRS clinical cases were studied: 38.4 per cent of grow-finishing pigs, and 30.8 per cent of nursery and suckling pigs. Concurrent pulmonary infections, predominantly bacterial, were identified in 60.2 per cent of the PRRS pneumonia cases. The three most frequently isolated agents interacting with PRRSv were: Pasteurella (30 per cent), S. suis (20 per cent), and H. parasuis (14 per cent). Concurrent pulmonary infections also seem to explain why both interstitial pneumonia and bronchopneumonia were common histopathological lesions. A total of 221 laboratory-confirmed PRRS virus (PRRSV) pneumonia cases were studied between February 1992 and December 1994.
lungs in which PRRSV was isolated on cell lines or alveolar macrophage culture systems. History and clinical signs were taken from the submission form in order to assign them to an age-group. In 87.8 per cent of the cases, the primary complaint was respiratory disease. The group was the most represented group at 38.4 per cent were grow-finishing pigs, and 30.8 per cent were nursery and suckling pigs. PRRSV was detected by fluorescent antibody (FA) testing in 95.4 per cent of the cases; virus isolation (VI) detected 63.3 per cent of the cases. PRRSV was found by both FA and VI in 130 (58.8 per cent) of the cases. Concurrent pulmonary bacterial infections were identified in 58 per cent of the cases. There were only four cases with concurrent swine influenza infection, so the total concurrent infection rate was 60.2 per cent. Therefore, 39.8 per cent of the cases were uncomplicated PRRS viral single pneumonia. The most common histopathological lesions found were interstitial pneumonia (66.1 per cent), bronchopneumonia (42.1 per cent), bronchointerstitial pneumonia (14.0 per cent) and pleuritis (12.2 per cent). Zeman D.H. 1996. 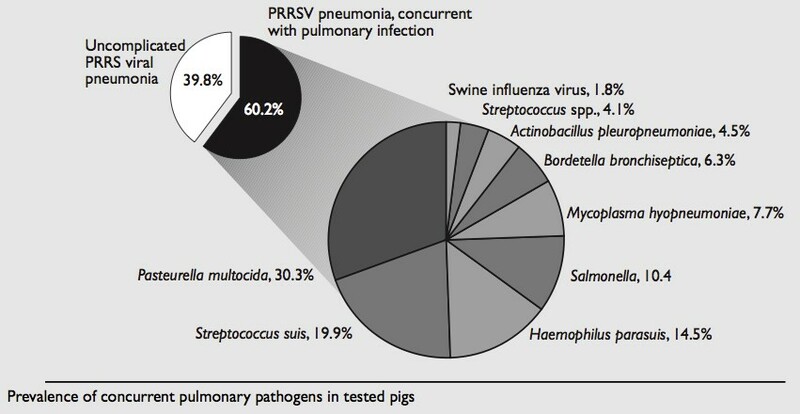 Concurrent respiratory infections in 221 cases of PRRS virus pneumonia: 1992-1994. J. Swine Health Prod. 1996. 4(3):143-145.